Taken with Olympus E500 digital camera July 4th 2007. Click image for larger view. In this macro photo you see the carnivorous plant sundew. This specific specie is known as Great sundew or English sundew (Drosera anglica). The sundew plants catch and eat insects to supplement their diet. 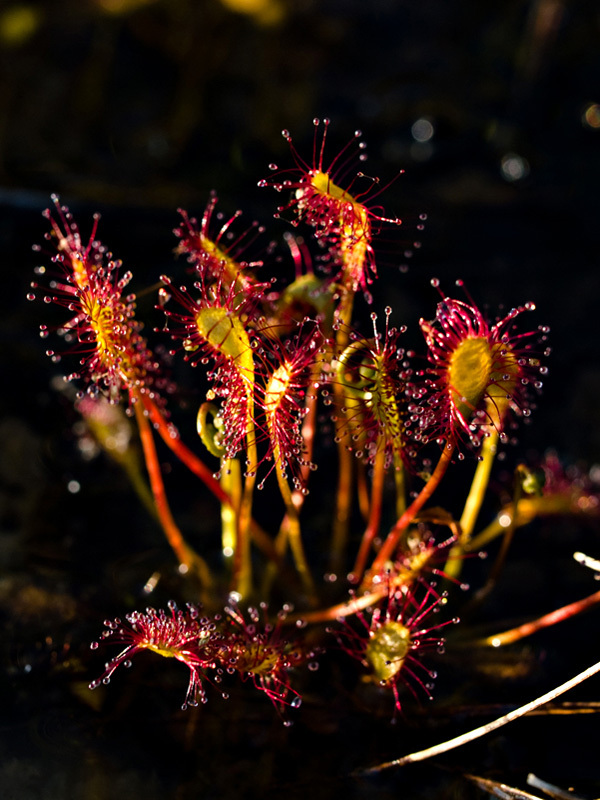 The sticky drops on the leaves attract insects and when they land the sundew plants close their leaves so the insects can’t escape. Beautiful and yet very deadly, what a combination, nice job in capturing this cool subject. Amazing shot… I am a WW participant, nice to meet you ! Now that is interesting!! I’ve never even heard of this plant before. I am from Iraq, we suffer from flies and mosquitos. Is is possible to plant carnivorous plant sundew in our land which is very hot in Summer and cold in winter with little moisture? If so, how can I get such plant? Thank you. I am looking forward to answering me ASAP.